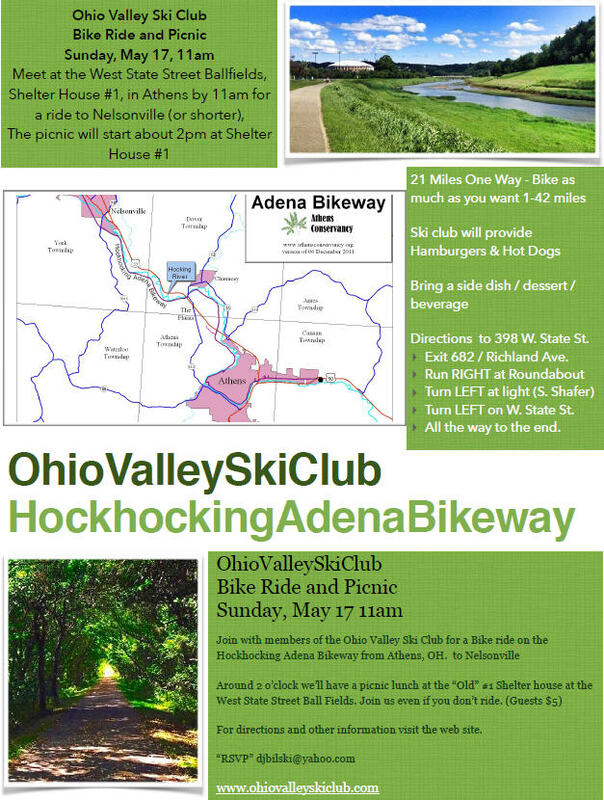 We hope you can join the ski club on a bike ride starting in Athens and going as far as you choose in the direction of Nelsonville. The path is paved and it’s the perfect time to try it. I know that ride has been on my list for a long time! The event is for ski club members – but guests are welcomed and encouraged to come and be active with us! Guest fee for cookout is $5, but if they join the club, it will go toward the membership fee. Black Diamond Bikes, at 11325 Jackson Rd. The Plains, OH has 7 bikes for rent. Please make a reservation if you need one. Sorry to report that because of the weather we are canceling the bike tour in Athens Ohio for Sunday, May 17. We do have a rain date of Friday, May 22 at 1 PM afterwards we’ll either have a picnic or go up to casa in Athens Ohio. So, start your memorial day weekend off early with a little biking in Athens Ohio Friday the 22nd at 1 PM see you there. We will meet at the same location.